Still in the 2010s, Jean Sibelius (1865–1957) is a world-renowned composer. Sibelius was inspired by national themes which he gave a modern treatment in his works. Sibelius was orphaned under the age of three, when his father, a physician, died of typhoid in the summer of 1868. The boy was able to complete secondary school thanks to financial support from his uncle. The Swedish-speaking Sibelius attended the Finnish-language Hämeenlinna Normal Lyceum and passed the school’s final examination in 1885. Sibelius was admitted to the University of Helsinki to study law in 1885 and, in that same year, started to study the violin at the Helsinki Music Institute. He soon abandoned his law studies. Sibelius studied composing under Martin Wegelius, the head of the music institute. It soon became apparent that Sibelius’s talent found its best expression in composition. Ferruccio Busoni, who joined the teaching staff of the music institute in the autumn of 1888, encouraged Sibelius to continue composing. The talented young man adopted his musical name in 1886 when he started to use his late uncle’s visiting cards, on which the uncle had had his name printed in the then fashionable French form, as Jean Sibelius. Sibelius’s knowledge of the culture of the Finnish-speaking people deepened when he became acquainted with the Järnefelt family in 1889. The Järnefelts’ daughter Aino would become Sibelius’s wife in 1892. With the help of Senate grants, Sibelius studied composition in Berlin from 1889 to 1890 and in Vienna in 1890–1891. He turned to Finnish folk music and the rhythms of Kalevala for expressive originality. Although recognised as a gifted composer, he was a controversial figure in Finland until the late 1890s. In 1899, after the publication of the February declaration by Emperor Nicholas II for the systematic Russification of Finland, Sibelius composed a number of works of political nature. The “Song of the Athenians”, a composition to a poem by Swedish poet Viktor Rydberg, was premiered in Helsinki on 26 April 1899, together with Sibelius’s First Symphony. The song, which emphasised sacrifice and the legacy of the ancient Athens, immediately brought Sibelius the status of a national hero. Even more important was the music composed by Sibelius for tableaux for celebrations for the Finnish Press in November 1899. After minor revisions, the last tableau, Finland Awakens, became the well-known Finlandia. The lyrics for Finlandia were written by the poet V. A. Koskenniemi in 1940 with the consent of the composer. The premiere of the Second Symphony on 8 March 1902 in Helsinki was one of the highlights of Sibelius’s career. The composition exuded power and heroism and inspired the people in the middle of the Russification campaign. The work received unreserved acclaim both from critics and the public. Sibelius’s success was overshadowed by financial woes. He ran into debt because of his extravagant lifestyle already in the 1890s. The debt increased in 1903–1904 when he built Ainola, his house in the artist community at Lake Tuusula, 25 kilometres from Helsinki. Thanks to patrons and income from his compositions, Sibelius avoided total bankruptcy. Due to deficiencies in the copyright system, he did not receive revenues from all performances of his works. The rights to his composition Valse triste, which he had composed in 1903 for a play called Death, written by his brother-in-law Arvid Järnefelt, he sold at a low price to a publisher, little realising how popular the song would be. The composition became world famous, and even restaurant bands included it in their repertoire. Sibelius achieved international fame in the early 20th century. In 1900, Sibelius went on a European tour with an orchestra conducted by Robert Kajanus with a repertoire that included the First Symphony and Finlandia among other works. Sibelius’s music was enthusiastically received, especially in Sweden, Denmark and Germany. Before the First World War, Sibelius gained a strong foothold also in Great Britain and the United States. In Russia, Sibelius received both praise and biting criticism. Not all of Sibelius’s compositions were favourably received. The critiques of the Fourth Symphony, which was completed in 1911, were mostly negative in Europe and the United States. Sibelius’s modern expression sparked criticism in the same way as Richard Strauss’s and Claude Debussy’s works. In the summer of 1914, Sibelius visited the Norfolk Music Festival in the United States, where he conducted The Oceanides, Finlandia and Valse triste. Many influential American music-lovers in the emerging superpower met with Sibelius in Norfolk, which boosted his popularity in the United States. In 1917, during the independence struggle, Sibelius composed his Jäger March to the lyrics of Heikki Nurmio, arranged for men’s chorus and piano. It became a symbol of the “white” Finland, which eventually won the civil war. As the civil war broke out, Sibelius moved to Helsinki to be safe from the red guards who were terrorising the countryside. The composer and his family moved to the home of his brother Christian Sibelius, the medical superintendent of Lapinlahti Mental Hospital. When things settled down, the family returned to Ainola. Due to a shortage of money and fodder, the composer was forced to sell the family’s horse. 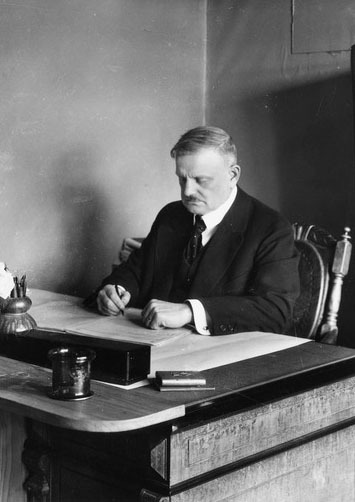 High inflation significantly eased Sibelius’s debt burden. After 1917, when Finland became independent, Sibelius was the best-known Finn in the world. At the same time he solidified his position as a composer genius who was looked up to by the whole nation. Thanks to donations made to him on his 60th birthday, Sibelius was able to pay off his debts. Improvements in the copyright system brought significant additional income to Sibelius, who gradually became a wealthy man. The copyright fees from Sibelius’s extensive production will continue to create considerable revenue for Sibelius’s offspring until 2027. Sibelius’s Seventh Symphony, which was to be his last, was completed in 1924. It was his intention to compose still another symphony, but it never got finished. Sibelius spent more and more time at Ainola and withdrew to privacy. The composer’s 70th birthday was noted internationally. He was particularly popular in the United States, Great Britain and the Nordic countries. When the New York Philharmonic conducted a survey of the favourite composers of their Sunday radio concerts, Sibelius came first, Ludwig van Beethoven second and Maurice Ravel third. During the Winter War, Sibelius’s fame helped to raise funds for Finland, especially in North America. The Sibelius Society, founded in Germany in 1942 on the initiative of the Propaganda Minister Joseph Goebbels, had a negative impact on the composer’s reputation both in the West and the Soviet Union. In 1935, Sibelius had been awarded the Goethe medal, Germany’s highest accolade for artistic merits. After the Second World War, the interest that Nazi Germany had shown in him became a burden to Sibelius. However, based on his diaries, he had a negative view of national socialism and its racial doctrines. After the war, Sibelius stayed largely out of the public eye. He died at Ainola on 20 September 1957 at the age of 91. His funeral day, 30 September, was a national day of mourning. Sibelius was buried at Ainola. After Sibelius’s death, his wife Aino lived in their house until the late 1960s. In 1972, Jean Sibelius’s daughters sold Ainola to the State of Finland to be opened as a museum. Ainola was opened to the public in 1974. The grave of Jean and Aino Sibelius is located in the yard of Ainola. Sibelius’s birthday, 8 December, is celebrated as the Day of Finnish Music and is also a national Flag Day. Still in the 2010s, Sibelius is a world-renowned composer. To classical music professionals and amateurs he is known as “Sib”. At the heart of Sibelius’s production are his symphonies 1 to 7. Among the composer’s best-known works are also the Violin Concerto, the orchestral works Finlandia, Karelia Suite, The Swan of Tuonela (part of the Lemminkäinen Suite) and Valse triste. Sibelius’s Violin Concerto is the most widely recorded violin concerto in the 20th century. His symphonies are the most widely performed symphonies in the world after Ludwig van Beethoven’s. Globally, Sibelius’s best-known compositions are Valse triste and Finlandia. Finlandia was the national anthem of Biafra in 1967–1970, when Biafra sought independence from Nigeria. Words commonly sung to the melody of Finlandia include the hymns “Be Still, My Soul” and “This Is My Song”. The Sibelius website of the Helsinki Finnish Club gives a comprehensive presentation of the life, works and career of Jean Sibelius.